You know it for sure that regardless of anything, a pair of jeans will always be hanging down somewhere in your wardrobe and a classic pair of pumps will never miss from your shoe storage, while the little black dress will give you a helping hand whenever you fail in finding other stylish solutions for a soiree. In the same way the classic trench coat is the permanent resident of your wardrobe and the ideal staple to hotfoot it around the city when the autumnal wind is whistling or the spring rain is pouring down on you. So, for any authentic fashionista investing in a classic beige or khaki trench coat is somewhat a mandatory requirement, let alone that being at the height of fashion calls for owning more than one trench coat of various designs and shades. Let us explore the anatomy of a trench coat and learn how to find the perfect trench coat for your own body shape, complexion and personality. It is worth tracing back to the early times and delving into the history of Great Britain only to find out that the origin of trench coats goes beyond any fashion-pursuing ambitions. Trench coats circulating so vigorously these days as a piece of stylist outfit and a powerful weapon for resisting rain drops were once withstanding mud and blood during World War I back in 1914. Before the British fashion house Burberry launched the first trench coats (buy Burberry trenches here! ), the British soldiers and officers were fighting against the enemy troops wearing heavy and soaking greatcoats that were restricting their movements, at times growing heavier twofold when soaked in water or mud. When Tom Burberry, the founder of the eponymous brand gave birth to a unique water-resistant tightly woven fabric called gabardine, the trench coat took the shape. The name Tielocken given by Tom Burberry was soon substituted for Trench Coat, when the British troops started to use them in the trenches. The lightweight fabric of the trench coats and their ankle length hemlines were very effective warrants for easy movements while the beige and khaki shades were making the officers homogenous with the land or the artillery smoke. The parade of trench coats continued during the World War II as well. After the World War II contrary to all the expectations that trench coats would be out of circulation, they started to be zealously used by a lot of travellers and investigators up to becoming the cult-favorite piece of clothing for femme fatales. The glamorous Hollywood became a terrain of voguish trench coats. Many gangster films were rendering classic trench coats thus making this post-war piece of clothing a symbol of self-confidence and smartness, while Audrey Hepburn donning a beige trench coat in the film “Breakfast at Tiffany’s’ laid the foundation for feminine trench coats to appear in different styles and colors under the tutelage of cult-classic Burberry. The trench coat originally meant for military activities was tailored and designed in a way as to bring ultra-comfort and functionality to the British troops. That is why each piece of design on the contemporary trench coat has its particular targeted function rather than just being a designer solution. The anatomy of a trench coat is pretty intricate and just like the human anatomy each of its organs has its specific function. Double Breast: A typical trench coat comes to be double breasted though nowadays single-breasted ones may also come into view. Additionally, it features ten buttons on the front. Originally double-breasted trench coats were the uniforms of British sailors as a protective method from wind aboard regardless of the fact from which direction the wind was blowing. This concept was later on adopted by the British military. Collar: As a rule, a trench coat also has a collar that can be raised and fastened with hook and eye at the neck serving as a scarf in the windy weather. During the war years these collars were not only for protecting one from the bad weather but also from the poison gas. Gas masks were being camouflaged under the collar so as to become airtight. Lining: The removable lining used both in the past and nowadays is for giving the body extra warmth and making the trench coat work both in the frigid and cool weather. In the past, this part of trench coat was also used as emergency bedding. Pockets: Nowadays the roomy pockets of trench coats seem to be just a part of design. But things were not like this back in 1914. The large and deep pockets were used for hiding maps, binoculars and other essentials. Over and above, the pockets of this super practical outerwear are open both from inside and outside. So while raining the outside pockets can be closed. Belt: A typical trench coat presents a belt at the waist that can be hooked up tightly in bad weather and be undone when you just yearn for showing off your mini skirt and athletic legs. Epaulettes: The straps at the shoulders called epaulettes were first of all indicating the rank of the trench coat wearer. Apart from that many officers and soldiers were using them to anchor some maps or gloves through. D Rings: D rings attached at the waist next to the belt were again for carrying some necessary items like grenades or swords. Storm Shield: The cape-like extra fabric at the back of the trench coat is used for ventilation. Sleeve Loops: Sleeve loops are for tightening the sleeves at the bottom so as the raindrops do not penetrate inside. Storm Patch or Gun Flap: This extra fabric on the right breast was performing the whole two functions: preventing the water from making an entrance and for carrying the rifle. After the World War II when women devouringly took possession of trench coats, our favorite fashion house Burberry and a range of other brands started doing a bang-up job by a wee bit deviating from the standard trench coat designs and colors and catering us to myriads of fresh new styles and shades. The variety of trench coats mainly lies beneath their lengths, some innovative strokes on the lapels and at the hems, as well as the shades. That is why nowadays every single woman can easily find her ideal trench coat that will match both her body shape and complexion. First of all let us see in what designs the trench coats routinely come to be and what tips you should follow while opting for your perfect one. Short Trench Coat: The length of these coats reaches a little bit above the hips and is advisable for women with short stature since the short trenches make them visually tall and just on the contrary tall women should shy away from wearing short trench coats to whatever extent is possible. However, if you are of short height with broad hips, avoid wearing short trench coats as well, otherwise visually you will look curvier. Medium Length Trench Coat: It comes to be the classic variant of trench coats and this was the very trench coat length that was used for attiring the British forces during the war years. This length befits almost every body shape and height, coming to be the ideal variant for short and curvy women. Tall women can also choose medium length trench coats combined with anything trendy and body hugging. Long Trench Coat: It goes without saying that long trenches are in no way for short women. However, if you aspire wearing a long trench while being a petite girl, it is strongly recommended to choose the length a little bit below the knee and of course, to wear high heels so as to professionally mask your short stature. As for tall women, long trenches will definitely give them grandeur and royalty. Trench Coat with Wide Lapels: This type of trench coat can work perfectly for petite girls if they want to somehow hide their slim complexion, while plus size women should undeniably stay away from this design. Trench Coat with Flaring Hems and Medium Length: This is a style excellent for ladies with hourglass figure and long athletic legs. Denim and Leather Trench Coat: Such trendy pieces are often seen with length below or above the knee and are suitable for every lady depending on her individual preferences. So as to create a stunning trench-coat-themed look the right design is not yet sufficient. You should also have flair for selecting a trench coat, the shade of which will ideally go with your skin tone. So take into consideration that if you are a dark haired mulatto girl choosing shades close to your natural tone is just contraindicated; so give navy blue, black, brown and grey trench coats a wide berth in lieu of taking notice of warm-colored or vibrant ones, such as lemon yellow, ruby red or orange-red. Fair skinned blondes will look just scene-stealing donning trench coats of all jewel colors and pastel shades. White color may flatter the natural tone of a chocolate-skinned girl while making light-skinned ladies look pale and sick. The original beige and khaki trench coats may definitely match any complexion when performing some plus-minus operations on the entire look. • First of all before acquiring a trench coat just make sure that you have pertinent clothing pieces in your wardrobe to match with. If the sporty things are predominating in your wardrobe then a trench coat will not definitely work, while classic and casual style following ladies are to leave no stone unturned to bring about a real reservoir rife with multiple trench coats. • The slim-fit trench coat is recommended to wear fully buttoned and with the belt fastened. However, if you decide to wear it unbuttoned just hide the belt somewhere, otherwise the hovering ends would give you some slovenly appearance. The trapezoidal trenches usually coming to be without a belt can be donned both buttoned and unbuttoned in either case maintaining your elegant aspect. • This universal piece of outerwear is not only multifunctional by itself but also in terms of being up to snuff with almost any piece of garment. You can wear it not only with trousers, jumpsuits, skirts, and dresses, but also with shorts and rompers, but it does not mean that you are not restricted to their specific designs. • While pairing a skirt with a short or medium length trench coat, mind the skirt to always be shorter than the coat itself in that way sustaining the symmetry in your look. • Slouchy pants, maxi dresses and skirts are not recommended to match with any trench coat. Short trench + maxi skirt combo may scream something like beachcomber, while flaring pants + long trench coat combo will at times visually give you extra weight. However in some cases you can engender a really idiosyncratic look by coupling a long floral-printed trench coat with an evening dress keeping in mind that the dress must be monochromatic. • Matching a mid-length and long trench coat with a skirt suit or pantsuits will instantly drop a hint that you are a business lady. What amendments you should do here is just keeping your skirt shorter than the trench and attaching a scarf or a shawl at the neck just to hide the blazer’s lapels and avoiding the double lapel sight. • Long trenches come to be in all their glory when matched with knee-length skirts in that case putting the emphasis largely on the athletic legs. The combo can look trendy when combined both with pastel and vibrant colors. Long trench coats also look effective with tight-fitting pants or just leggings. • Denim trench coats of medium length are all the rage now and they look dazzling with any white cotton dress. Wearing denim pants or skirt with a denim trench coat is definitely not approved. • A leather trench coat is an inseparable attribute of a daring outfit only if you know that a leather skirt with a leather coat is far from being trendy, while a pair of jeans will look cool in combination with this audacious piece. Every single color looks quite different against different skin tones. This statement is also true when it comes to mixing and matching various shades on one single ensemble. For instance, black will lose all its glory if combined with brown and will shimmer against sky blue; brown and white come to be an ideal couple while white and lemon yellow will bring about some pallor and will flatter if replenished with grey. That is why owning a trench coat does not yet mean that you will look trendy and voguish in bad weather; more significant is to know how to wear a trench coat and how to effectively colorblock it. Check the slideshow below to discover the trendiest trench coats of the moment and buy them right away! • Black Trench Coat: One of the classic colors for trench coat is definitely black and overall it is universal, which implies going well with almost any shade. However, dark colors like brown, navy blue or gunmetal grey will in no way work with black. The black and white combo is an embodiment of elegance, while the black and red combo will make your look somewhat pressured and dramatic. Matching a black trench coat with denim pieces is a universal option and makes you sorely gratified every time you are in a hurry and need to slip into something trendy and practical. You can also match your black trench with a beige or silver grey skirt thus creating a very fresh and soft look. Vibrant colors like orange, lemon yellow, pink or mint green are advisable to pair with a black trench coat in the form of scarves or handbags. • Beige Trench Coat: This is the iconic color for trench coats. After all, the first trench coats were exactly beige ones. Matching beige coats with powdery blue, grey and brown pants, skirts or dresses will bring about a street-style-worth outfit, while a beige trench with black boots or pants will look somewhat conventional and regular. • Brown Trench Coat: Just like the black color, this dark shade is again not recommended to wear with any gloomy shades. You should be quite tactful while donning a brown trench or else it may threaten to make you look older than your actual age. The brown trench combined with a white piece will really look fresh and trendy, while with pastel pink pieces brown will shine in all its glory. • Grey Trench Coat: Another classic color for a trench is grey in all its shades. Creating cool combinations with silver or ash gray is an easy task to perform. You can don a grey trench with any black piece or blue pants with a white shirt tucked under it. Amaranth pink or mauve dress worn under a grey trench might take your look to a fresh new romantic level. In some cases grey looks great with some tiny yellow details like a scarf or some prints. • White Trench Coat: What you should keep in your mind from the very beginning is not to bring more than one color with white trench. If you decide to match it with a black suit, never add any other third shade to your whole look. If you prefer dodger blue pieces with a white trench coat, keep your entire look within these two colors. White with scarlet red or coral make blonde ladies just drop-dead gorgeous. • Red Trench Coat: When donning a trench of any vibrant color your matching pieces should definitely be dark and muted. Red looks stunning with grey or navy blue pieces, but it is undeniably the red and white or red and sky blue combos that will catch everyone’s attention. • Blue Trench Coat: Blue has a range of shades ranging from navy blue to turquoise to aquamarine and what makes this color so coveted is that its shades can be effectively mixed and matched with each other. Just try to match your navy blue trench with turquoise pants or skirt and replenish them with a white shirt. True blue trench coats with white pieces create a screaming office-style look; a navy blue trench with red, yellow or orange pieces will make unique combinations, too. • Green Trench Coat: While styling your green-trench-based outlook it is necessary first to look at its shade. Mint green or Paris green trenches will work best with white or silver grey pieces, while darker shades of green like olive green or teal green trench coats should be matched with navy blue or dark purple pieces. • Yellow Trench Coat: Yellow is the color of youth and positive energy, so sauntering along the street with a yellow trench you will undeniably keep the spirits of all the passers-bye. Yellow trench will add to its charm in combination with all the shades of blue, at times successfully working with black, as well. • Pink Trench Coat: Pink trench will always give you a fruity and flowery appearance. You can wear your pink trench with coral, crimson or yellow skirts and shirts but pink against all the shades of blue has all the chances to raise you to an It Girl level. Many trench-coat-fancier ladies may face some difficulties while trying to find the best shoe style to be matched with a trench coat. This is not that much complicated a task as it might seem at first sight, since almost all styles of footwear can in this or that way create a lovely ensemble except for sneakers that may in rare cases work only in the hands of an expert fashionista. Short trenches are recommended to wear with high-heeled knee-high boots, while ankle boots should be avoided as they may visually shorten the legs. Long trenches with flat ballerinas look very romantic and fresh, though shoes with small heels may also work well with long trench coats. Platform shoes and brogues are just other alternatives to wear with trench coats. 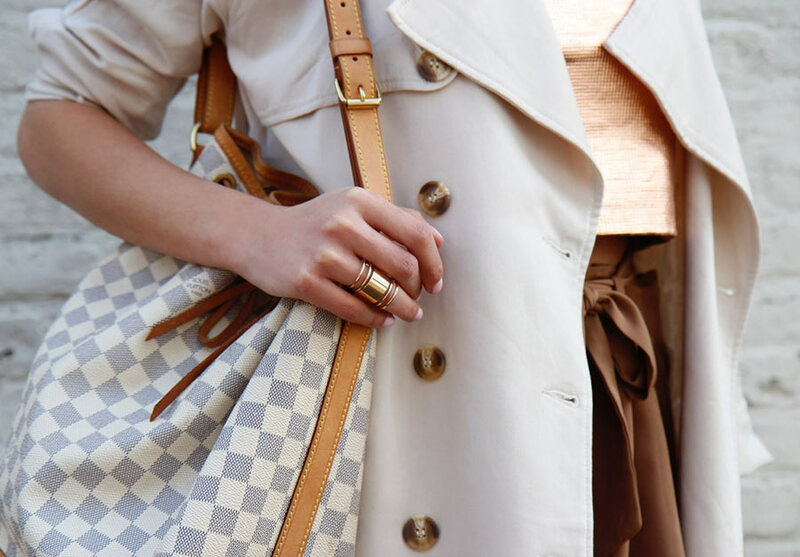 Trench coats can double their oomph if complemented with the right accessories. Scarves and chiffon shawls romantically tied round the neck may create a look worth for sauntering among autumnal crunching leaves and it is necessary that you accorded the shade of the scarf with that of the trench. The ’50s-inspired trench coats with flaring hemlines will look super-elegant with tonal gloves and doubly elegant when finished off with a fedora or homburg hat. Handbags and shoulder bags will look equally cool whether matched with a short, medium length or long trench. A classic watch will finish off any look. Now that you have a bunch of tips under your belt on how to wear a trench coat, do not hesitate to own this iconic piece and if you have already acquired one we have one last tip for you: experiment, experiment and once again experiment!